Metro Flyer Special Halloween Deals 29 Oct 2018 contains good food and gift opportunities for Halloween. For this special day, you can find special ideas. Tomorrow is Halloween. What you will to at night? Make your super plan and go ahead! Metro flyer contains whatever you need. Choose delicious foods or gifts which is discounted for you. Metro discounted products looking amazing. Do not waste your time at other sellers. Metro flyer giving huge advantages. From deli to meat opportunities, a lot of food varieties on sale now. Deli entertaining is very wide in Metro Flyer Special Halloween Deals 29 Oct 2018. 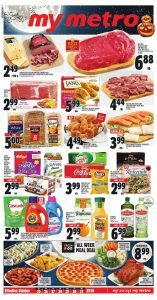 Metro provides all discounted foods in one flyer. Metro flyer is one of my favorite. Especially bakery page. Before going to work I always going to Metro for bakeries. They are daily and delicious so much! Thanks to Metro flyer we can check out what’s on sale this week. Enjoy your Halloween!